Kitchen islands are getting bigger, quirkier and more creative. Maybe you have an 11 foot-long counter straight out of a fifties diner, or maybe you’ve used a hunk of raw wood cut from the center of a fallen tree. 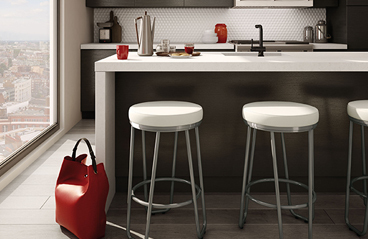 Once you’ve found the perfect island, the next step is to pair it with a few choice accessories. You don’t want to have an empty desert island in the middle of your kitchen, just waiting for debris like junk mail and keys to clutter it. 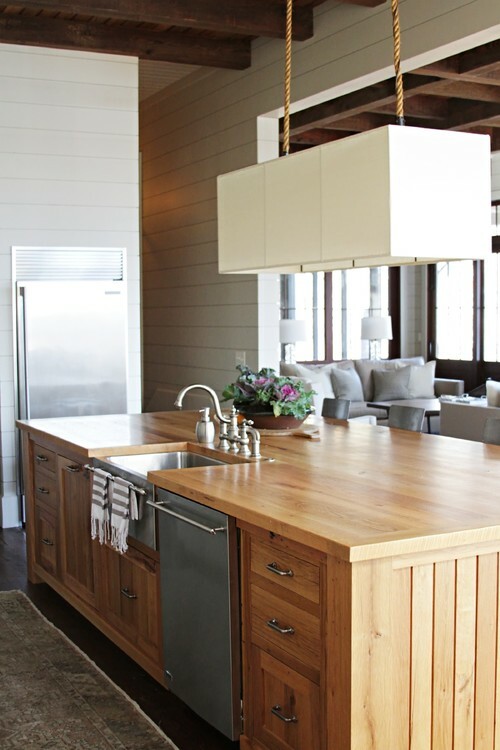 Take charge and decorate with accessories that complement your island. Make sure that whatever you choose leaves enough room on either side for prep work or a place setting. 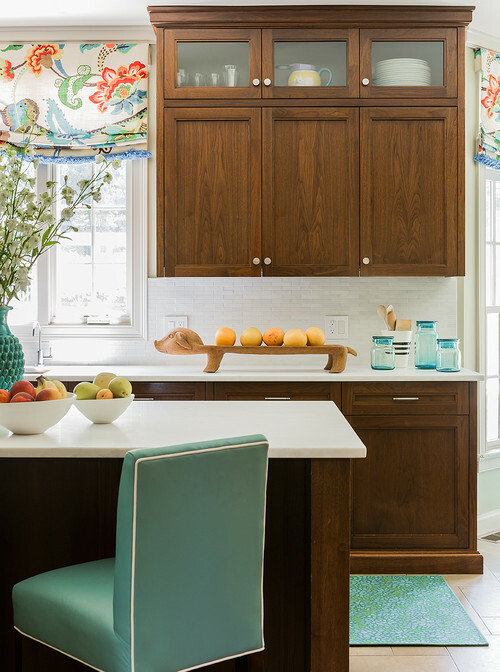 Measure the open space between placemats or cutting boards—plus a small buffer area—to find out how much space you have to decorate. 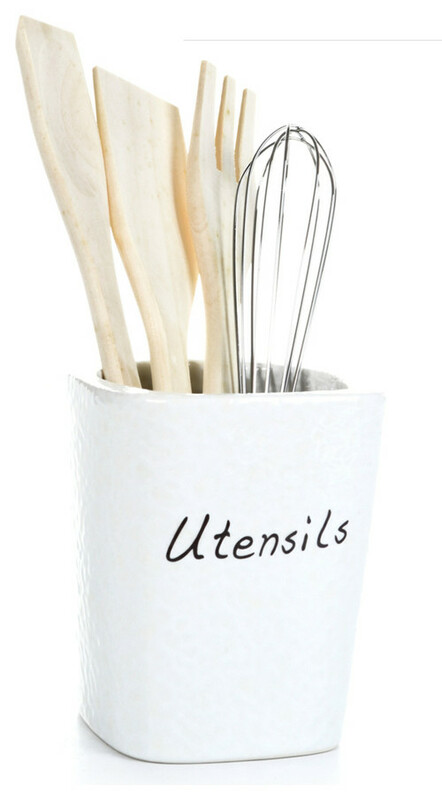 Keep your spatula, whisk, and wooden spoons in easy reach by standing them on your island in a beautiful pitcher. You can get a basic white pitcher from Ikea or a colorful, classic pitcher from Le Creuset. Between the color of the vase and the color of the petals, your choices are endless. Also consider what you prefer—fresh cut, dried, silk or even wooden flowers. Who said that fruit has to live in a bowl? We love the fruit tray as a versatile spin that adds color and keeps healthy snacks on hand. A long, narrow tray like maximizes open space and lets you pattern fruit in a row for an unexpected pop of color. Color plus pattern plus functionality—the best of all worlds! Le Creuset (again) makes wonderful iron trivets that look like lace but will last for decades. Tramontina also makes iron trivets that are both eye-catching and affordable. Kitchen islands need attractive, versatile lighting, and a pendant lamp lets you create your ideal look and feel. Wide lamps work great with wide islands, as do pairs of single lamps. Smaller islands often only need a single, smaller lamp. Attach a dimmer to make your island all-purpose—a place where it’s easy to go from reading to cooking to a relaxing glass of wine. What do you have on your kitchen island? Stop by our Facebook page to let us know, or show us what you have—or what you hope to create!